The DRCSU elections (2018-19), after having survived a good amount of ups and downs faces another jeopardy as one of the presidential candidates asserts her role as the ‘co-president’. Sonia Sehrawat, who contested for the post of President in the Daulat Ram College Students’ Union (DRCSU) Election, 2018-19 held in September 2018, has recently taken the college students by surprise through a Facebook post. In the post, she openly declares her position as the co-president of the college; a post that is non-existent in the union. The post of “Co-President” does not exist in the Constitution of Delhi University, which Daulat Ram College follows in its electoral process too. Sehrawat also took to Facebook to post her official appointment letter, given to her by the Chairperson of the college, who has been missing since the beginning of the election. The elections that took place last year saw a series of controversies as it is and this recent development is only giving a rise to the already burning flame between the then competitors. The present union is, in fact, organising a protest in front of the administration office on 12th February, 2019 at 10 a.m.
Sehrawat, a third-year student pursuing Botany Honours in Daulat Ram College, University of Delhi has thanked three men in the Facebook post. She has referred to them as a “constant support” in her “5 months of continuous struggle”. One of the three, Akshay Lakra is, as a matter of fact, the State President of National Students Union of India. 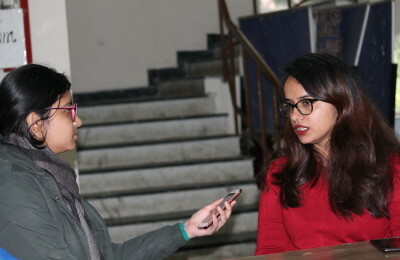 Diksha Verma, the current president of DRCSU, when asked about the actions taken by Sonia Sehrawat had this to say: “This is a mockery of the mandate of the students. And I, as the elected president cannot let this happen.” The actions were ‘taken behind her back’ and the union was unaware about any such happening or decision. The appointment letter that confirms Sonia Sehrawat’s post as a co-president was issued on the 11th February 2019, and is allegedly the result of a meeting held in the college on 22nd November 2018 between the Principal, Chairperson, and Representative of the Students Advisory Board. The official minutes of the meeting will be released tomorrow, so there is little clarity if the decision to inculcate Sehrawat as the co-president came unanimously. On 12th February 2019, the Principal of Daulat Ram College released a notice after false news of the appointment of a Co-President was spread across, clarifying that the elections were free and fair and there’s no addition to the union. The Chairperson of the college, who has no role to play in the union elections had sent an appointment letter to Sonia Sehrawat who had lost the Presidential elections with around 70 votes.The Chairperson without considering all the minutes of the meetings took this drastic step which reflects dictatorship and authoritarianism. Through the minutes of the meeting held on 22nd November 2018, it was clarified that a team consisting of all the students who are not part of union be made part of a secondary team which would be headed by Sonia and Neha, both presidential candidates. It was further decided that they be appointed as ‘Co- Presidents’ and be given definite goals and duties. However, this team in no case will supersede the role of Union headed by the duly elected President. Previous PostMismanagement at Lady Irwin College: Issue of Stampede, Security, and Fake Passes Next PostMaitreyi College Successfully Organized Rhapsody’19!